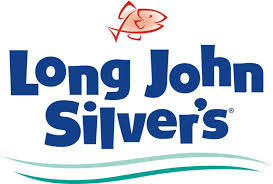 Long John Silvers announced they will once again have all you can eat Fish or Chicken and sides this Sunday, April 21, 2019 starting at just $7.99! Offer valid at participating locations for dine-in only from 11am-7pm! 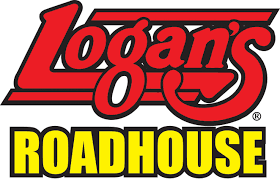 Logan’s Roadhouse has this coupon valid for 20% off of your entire check now through Sunday, April 21, 2019! Present coupon when ordering. Good on food and non-alcoholic purchases only. Valid for dine-in or carry-out. Not valid in CA, NC, SC or Augusta, GA locations. Cannot be combined with any other offer, coupon or discount. Get a free kids meal with THIS Logan’s Roadhouse coupon. Good on Saturday and Sunday, April 20-21, 2019. Present coupon when ordering. Valid for kids age 10 and under. One free kids’ meal with adult entrée purchase. Dine in only. Must present offer to receive a discount. Not valid in conjunction with any other discount, coupon, promotion, or limited time offer, such as American Roadhouse MealsTM, Happy Hour, Burger & Brew or Steak For Two (other exclusions may apply). Not valid at CA, NC, SC, or Augusta, GA locations. Valid Saturday, 4/20/19 – Sunday, 4/21/19. 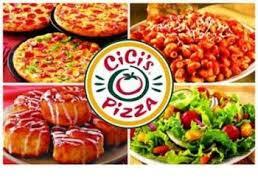 Get pizzas for half off at Cici’s Pizza when you order online and use Cici’s Pizza online coupon code 8006 good today through May 19, 2019. You can also get medium pizzas, brownies, cheesy bread and cinnamon rolls for $3.99 each during the Cici’s takeout special. Red Lobster has a $10 Fish Fry every Friday now through April 19, 2019. The $10 special ends at 6 pm. Get hand-battered wild caught cod served with fries and cole slaw for $10. Red Lobster announced the special in This Email. Red Lobster also has an early dining special every Monday through Friday between 11 a.m. and 6 p.m. Each special is priced at $15. On Fridays enjoy Jumbo Coconut Shrimp: Hand-dipped jumbo shrimp tossed in flaky coconut and fried until crispy perfection. Dip them in our signature piña colada sauce and enjoy. $15. You can find the complete Early Dining menu at: Red Lobster Weekday Win. 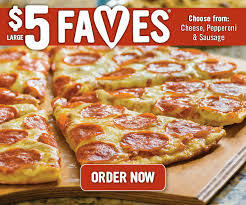 Papa Murphy’s has large Faves pizzas for $5 (regular price is about $6 – $7) on Fridays at most locations. To get the deal, start from the Papa Murphy’s home page, then click View Menus, select your location, click Order, then click Classics & Specials. Scroll down to the Faves selections. Offer valid for Large Pepperoni, Sausage, or Cheese FAVES pizza at participating locations on Fridays only. No substitutions or additional toppings. Not valid with any other offers. Sonic 50 Cent Tots Today! Head over to your local Sonic today and get potato tots for only 50 cents with a Sonic Drive-In text coupon! 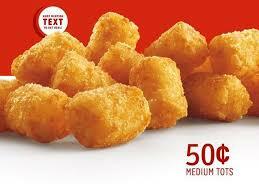 To get the offer, text GOLDEN to 876642 and get medium tots for 50 cents all day. You must ask for the tots special when ordering and show the text coupon to your carhop to get the Sonic special. Limit 5 orders at special price. This offer was announced on Sonic’s Facebook page. Limit 5. Must mention and redeem text offer at time of order/purchase. Excludes Add-Ons, Order Ahead, and delivery. Valid April 18, 2019 at participating SONIC® Drive-Ins while supplies last. Del Taco has Grilled Chicken Tacos priced at three for $2.29 every Thursday from 3 PM – 11 PM. Offer valid at participating locations, for a limited time only. More details on the Del Taco Specials website. Dave & Buster’s has Unlimited Wings + Unlimited Video Games every Thursday for just $19.99. 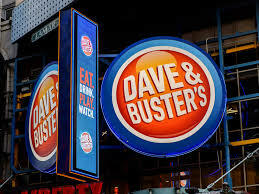 For more details visit: Dave & Buster’s Unlimited Wings Special. 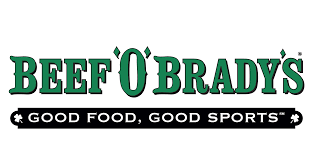 Beef O’Brady’s has 79 Cent Wings on Wednesdays! Valid at participating locations – no coupon necessary, but you can check out this link for details. 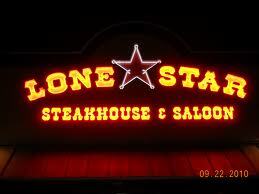 Lonestar Steakhouse 2 for $25 Prime Picks Menu! We found this amazing deal from Lonestar Steakhouse – where you can order 1 appetizer and 2 entrees for only $25! Offer valid before 5:00 p.m. at participating locations.